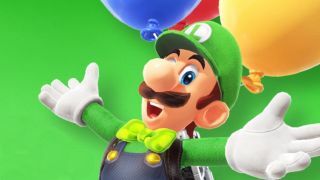 It's not Super Luigi Odyssey, but it'll do for now: Nintendo has announced a free update coming to Super Mario Odyssey in February that will add a new online mode called Luigi's Balloon World to the game. Appropriate to its namesake, the game is partly about fading into the background and not being found for extended periods of time. Once you beat the main story mode of Super Mario Odyssey (which is also when many other parts of the game open up - you should definitely do that if you haven't yet), you'll find Mario's lanky brother half-floating around the various kingdoms. Talk to him and you can play Balloon World in one of two ways: either go into "Hide It" mode and you'll have 30 seconds to stash a balloon somewhere in the stage, or pick "Find It" mode and choose another player's balloon to try and sniff out in the same length of time. By finding more and more balloons, you'll increase a unique set of stats and move up in the rankings. Beyond bragging rights, you can earn a tidy sum of coins by performing well in Luigi's Balloon Land. Why not drop them on the new outfits coming to the game? Here are the Sunshine Shades and Sunshine Outfit, the Musician Hat and Musician Outfit, and the Knight Helmet and Armor. Then use the new Snapshot Mode filters to take some really trippy screenshots of them. Need more stuff to look forward to on Switch? How about a few hundred deaths in Dark Souls: Remastered, or all the rest of the upcoming Nintendo Switch games?